Pokémon Let's Go Switch Console Announced, New Game Details | Nerd Much? Nintendo announced a couple of new Pokémon Let’s Go Switch bundles today. 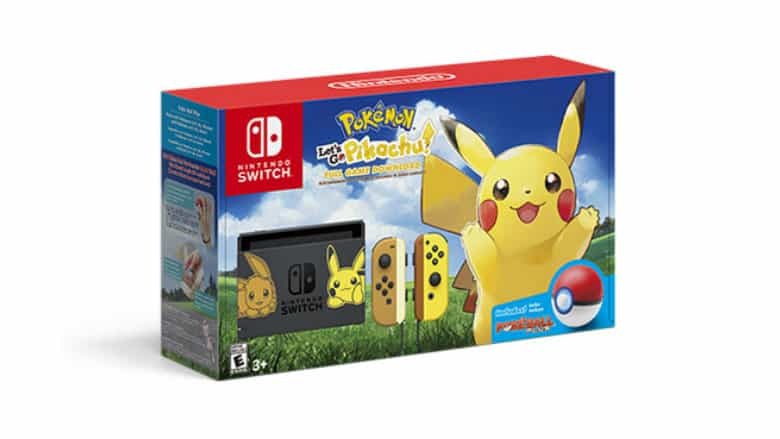 The fresh consoles sport an adorable Eevee and Pikachu on the system’s dock, with shadowed images of the characters on the back of the Switch itself. Each of the Pokémon Let’s Go Switch consoles also has Eevee and Pikachu themed Joy-Cons included. They come bundled with the Poke Ball Plus accessory that you can use to play the game. And, of course, a code for which ever version of the game you’ve opted to buy. The Pokémon Let’s Go Switch bundle is being priced at $399.99. The new consoles will release simultaneously with Pokémon Lets Go Eevee and Pokémon Lets Go Pikachu. New details on the game’s themselves were doled out today too. Both Pikachu and Eevee will be able to learn Secret Techniques in the upcoming game. The three mentioned are Chop Down, Sea Skim and Sky Dash. As the name implies, these allow your character to quickly clear trees, swim and fly to previously visited locations. New moves for the titular characters were unveiled too. Pikachu can wield Pika Papow and Splishy Splash. Pika Papow is a physical attack that increases in stats depending on how strong your bond is with the Pokémon. Splishy Splash is a water move that has the ability to paralyze opponents. Nintendo detailed 4 exclusive moves for Eevee. Veevee Volley is the same as Pikachu’s Pika Papow. Bouncy Bubble is a water move that heals Eevee for half the damage it inflicts on your foe. Buzzy Buzz is an electric move that can paralyze. And Sizzly Slide is a fire move that will always leave a burn on your opponent if it lands. Pokémon Lets Go Eevee and Pokémon Lets Go Pikachu only a couple of months out now. The games themselves, as well as the Pokémon Let’s Go Switch bundle, releases on November 16th.